Storage: Wrap in a paper towel and place them in an open plastic bag in the fridge. Preparation: Swirl in a bowl of water until free of any dirt. Discard any large stems. These are great added to a salad or sandwich, or lightly sauteed. They make a stunning garnish, too! Nutritional Benefits: Pea shoots are packed with vitamins A and C, and are a great source of folic acid! They're also a surprising source of protein. 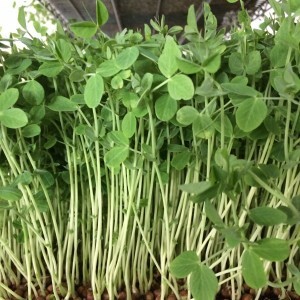 Like any microgreen, pea shoots are harvested right after germination. All the nutrients the plants need to grow are in these shoots, making them extremely healthy!